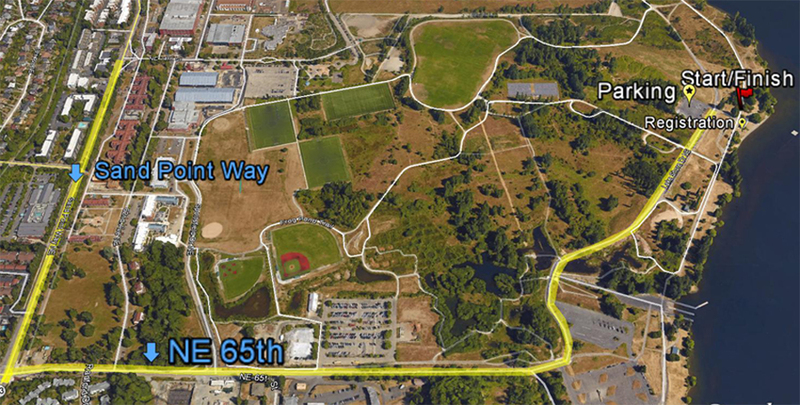 Once you reach Magnuson Park via Sand Point way it is about a 15-20minute walk east to the start area. You can follow cross park trail or follow the driving directions to get to the start line. View the map above. You can store your bag at our registration booth, just any of the volunteers to hold on to it. The Burke-Gilman Trail is approximately ¼ mile west of Warren G. Magnuson Park. With a traffic signal and crosswalks, the N.E. 65th Street crossing is the safest point to enter the park. There are bike racks by the start/finish. Please note that bicycle riding is limited to paved surfaces within Warren G. Magnuson Park. You can store your bag at our registration booth, just any of the volunteers to hold on to it. From the N.E. 45th Street exit, go east on 45th, past the University of Washington, and down the 45th Street ramp. Continue east past University Village Shopping Center. Bear left and continue about 2 miles on Sand Point Way. You will pass Children’s Hospital and Regional Medical Center and Sand Point Village/Princeton Avenue.